Happy Bloggers Challenge Friday! Thanks to those who played along with last weeks Friendship Challenge, this weeks challenge is Backgrounds (use Background Stamps or create your own Background). I opted to go with the Make Your Own Background for this weeks challenge by creating a Mixed Media Tag using a combination of images from Stampotique Originals Rubber Stamps, Acrylic Paints, Stencils and the Gelli Arts Plate. Oooh, I love this tag with the quirky diva and the zingy colours. Wishing you a wonderful relaxed weekend. Love the mix of colors on your tag's background! So fun with the diva image! Fabulous tag, loving the background colors you used and of course I adore that sentiment! So great to see you having fun with MY stamps! Lol. She is adorable on your bg. Fabulous background for that fun and funky gal! Happy Weekend! Nice background and color. It's perfect for Anything Goes. Thanks for joining us over at Stampotique's Designers Challenge. So nice to have a friend with whom to share creative time and stamps!! Beautiful Stampotique images against a vibrant background. A win-win combo in my book! Thanks for participating with the Stampotique challenge! Aww! Your tag is so pretty, and that image is ADORABLE! Fab background, and the image and the words together made me grin!! 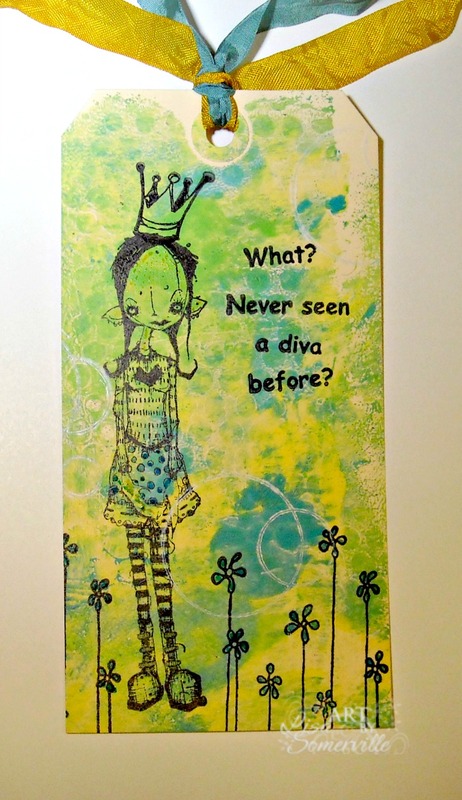 Love your Gelli plate background and the stampotique image works so well! Cool diva tag. Love that gorgeous background. I adore this tag you've made! The color palette is gorgeous as well as energetic and I was so impressed at the texture and depth you created! On top of that, you've got this great image and sentiment! This piece is the perfect mix of elegance and whimsicality. It made me smile as well as feel inspired. Thank you so much for sharing this with us for this week's Simon Says Stamp Monday Challenge blog! glad to be back playing on bloggers challenge..
Fab bright and cheerful tag. Thanks for joining us again this week at Stampotique.